The factory Beta rider laid down the law once again and took his first double win of the season in the scratch category! He is therefore 16 points ahead of SALVINI before the Grand Prix of France. Behind HOLCOMBE, we find the smiling Brad FREEMAN (GB - Beta Boano). The Beta Boano rider this time stood up to his compatriot during 7 specials but could not cope with the fury of HOLCOMBE at the end of the day. 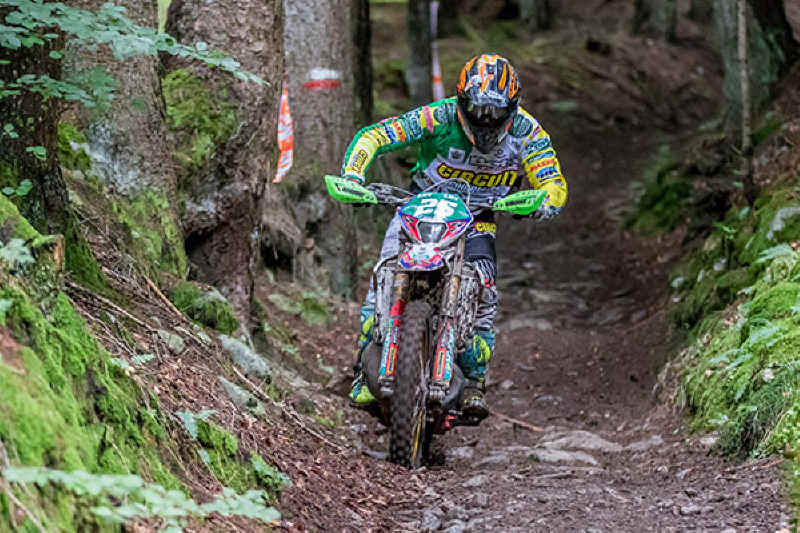 Thomas OLDRATI, Christophe NAMBOTIN (F - Gas Gas) and Giacomo REDONDI, all three fighting for the last step of the podium all day long, could not overhaul SALVINI and they had to settle for 4th, 5th and 6th places respectively. Note also the strong performance of Anthony GESLIN (F - Beta) who placed Top 10 overall. 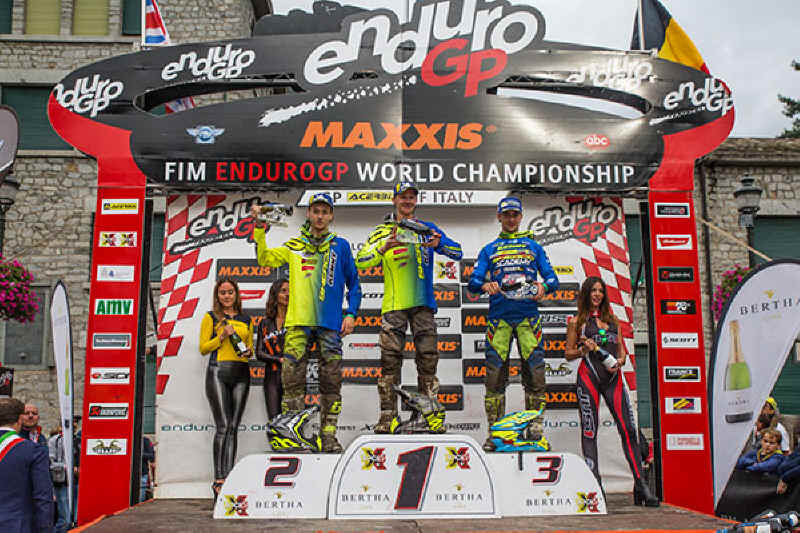 In Enduro 1, it was Brad FREEMAN who was uncatchable once again and he increased the gap on his rival and countryman, Jamie MCCANNEY (GB - Yamaha). Although he finished second, the Outsiders Yamaha rider was not able to keep pace with the 2018 Junior World Champion and finished almost 3 minutes behind him. FREEMAN now has 24 point lead after these two days of racing. Behind the British duo, it was again the factory Gas Gas rider, Antoine BASSET (F), who climbed onto the 3rd step of the podium. He left no chance for Davide GUARNERI (I - Honda RedMoto) who, for his part, struggled for a long time with Diego NICOLETTI (I - Husqvarna) to secure the 14 points of 4th position. 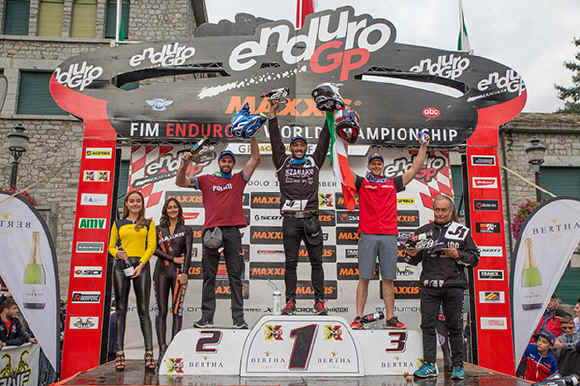 It was a 100% Italian podium in the medium-sized Enduro 2 class. Unhappy yesterday, SALVINI raised the bar by winning the day even if he had to give everything to counter the pace of his compatriots OLDRATI and REDONDI. For a long time, OLDRATI thought he could take his first victory with Honda RedMoto but SALVINI, as in Castelo Branco (Portugal), put in an electrifying last lap. Less frenetic than the day before, Eero REMES (SF - TM) had to make do with 4th place, while Loïc LARRIEU (F - Yamaha), in great difficulty all day with his chain coming off twice, closed out the Top 5. This allowed SALVINI to widen the gap a little more and to arrive in France with a 20 point lead ahead of the Finn, and 21 over the Frenchman. Doubles for CAVALLO & MACDONALD! With this new victory in Junior, CAVALLO also won J2 ahead of Joe WOOTTON and David ABGRALL, while VERONA won J1 in front of Théo ESPINASSE and Leo LE QUERE (F - TM XCentric). 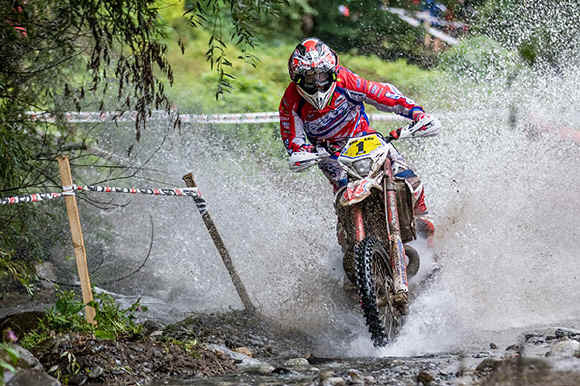 This Acerbis Grand Prix of Italy kept all its promises with a demanding course and beautiful special tests. The rain this weekend failed to put a dampener on the competition and this GP has been a turning point in the season. See you at the next round in Méthamis on September 22nd and 23rd for a Grand Prix of France that is sure to be thrilling! Brad FREEMAN : "I'm very happy with these two victories! I've increased the gap in the standings in E1, and I must admit that I was annoyed to finish so far from Steve yesterday... So I'm pretty happy to have stood up to him today." Alex SALVINI : "After the inexplicable fuel problem yesterday, I was keen to catch up today. I quickly realised that I could not get Steve, but I'm still happy with this podium in EnduroGP, and I limited the damage. Nobody is immune to a mechanical problem and there are still four days (two rounds) left to race, so I remain confident in my title chances in EnduroGP... "
Hamish MACDONALD : "I am very proud to be the first New Zealander to win a round of EnduroGP, and in addition to that I've now done the double! I have not called my parents yet, but I'm sure I'll wake them up and tell them! Everything is still to play for with the title and especially now that I have tasted victory…"